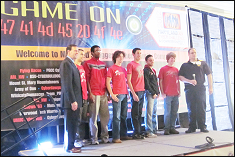 University of Maryland's Cyber Security Club Competition Team won first place in the college division of the Maryland Cyber Challenge and Conference (MDC3) at the CyberMaryland Conference held at the Baltimore Convention Center on October 17, 2012. Teams were challenged to a six-hour "Capture The Flag/King of the Hill" variation which consisted of hacking into machines and protecting them from other competitors' attacks. The team won the top prize among the top 8 finalists within the college teams. Each team member will receive a $5,000 prize.